This is the first of my on-going updates of games which I have already reviewed, have now played again and had some more thoughts about them. Tobago is a fun, relatively simple game with some fresh gameplay mechanics, a beautiful board and lovely pieces (initial review here). I’ve even seen talk of it being a nominee for the Spiel des Jahres – I can imagine that coming true but it’s a long way off yet. Ever since I saw the photo of Tobago, I was looking forwards to it. When I read the rules, I was even more certain. Then I played it, and Tobago delivered. 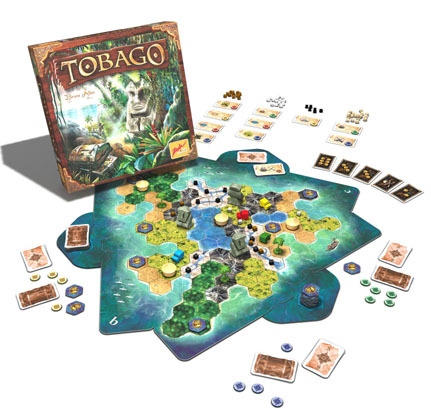 I like games that offer a fresh game mechanic and Tobago was great because it’s beautifully diffferent. The game focuses on determining where treasures are hiddden, primarily by playing an accumulation of clue cards to discern a treasure’s precise location, like “it’s not next to a palm tree” or “it’s in the biggest jungle”. When the location of a treasure (there are always four being sought) is reduced down to just one hex/location, it can be picked up. Instead of adding clues, you can drive your ATV to pick up treasures or amulets. When grabbed, the treasure inside is revealed and shared between the players who helped find it.